How to cook prawns on a barbecue (little ones, not king prawns). You know the problem. If you pop them on the barbie individually then some inevitably fall through the bars and into the coals. Those that escape that fate must be turned individually - a tortuous exercise involving the loss of even more prawns and the burning of fingers. 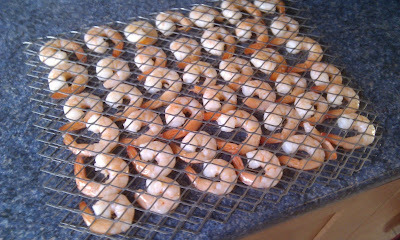 You could thread them on a skewer but small prawns are liable to be split asunder, leading to further prawn loss. No more prawn loss with the Prawnvelope! To make your Prawnvelope you need a fresh mesh from a disposable barbecue (this might involve re-using an old mesh from a previous barbie so you can liberate a fresh mesh for this purpose). Carefully fold the mesh in half. Don't crease the fold flat - use a former of some kind to get a prawn-sized radius on the fold. Insert the prawns into the Prawnvelope. The mesh itself should hold them in place but, if you're nervous, use some food-bag "ties" to secure the edges of the assembly. Now spray your prawns with oil, lemon juice, black pepper, whatever, and commit them to the barbie. You see how easy it is to flip them all in one easy action?